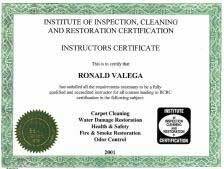 Ron Valega has been in the home restoration business since 1977, specializing in Water and Fire Damage, Content Cleaning and Dehumidification. As a successful restoration franchise owner, Ron realized volume sales of up to $1.5 million annual. He understands fully the dedication required to maintain a growing business while answering 2am Emergency calls, carrying a cell phone and pager 24/7 and continuing his own education to remain informed of industry changes, trends and the latest technological advances. As a Franchise Trainer, Ron’s responsibility was to teach students - men and women entrepreneurs - the Restoration Business and how to themselves become successful. Training included not only the “how-to’s” of Restoration but also, Sales, Marketing, Production and Goal Planning. Ron understands fully that owning a business is not merely knowing how to perform a particular service or make a particular product: You must be able to manage the back office, cash-flow, and build relationships with clientele. As Ron’s own business grew, he realized a passion for teaching others about the Restoration Industry. Ron saw a need for the Insurance Companies as well as new Restoration Businesses to know how true mitigation should be handled. Ron developed his own focus on Restoration (no construction, no painting, no carpet sales) and merged that into his classroom techniques. He teaches not only how to succeed in pure Restoration but also to know what should be expected from Restoration firms. In the Spring of 2002, Ron sold his restoration business to focus on teaching 100%. Ron believes “Mitigation is a Craft”. As with any Craft, it must be both studied and practiced to be successful. He himself has learned that “Education is the Key” to operating a successful business. Now he wishes the Insurance Industry to know the Restoration Industry and for the two to learn to understand each other. With this platform, Insurance companies such as Farmers Insurance in Ohio and Michigan and Allstate Insurance have hired Ron to educate their Adjusters. Currently, Ron teaches classes in the United States Nationwide and in Canada for the Restoration Industry and others interested in learning how to correctly mitigate water and fire loss damages, as well as how to develop and improve sales and marketing techniques.